Bird Traps work well on grackle, sparrow and other birds that can be baited into the trap. 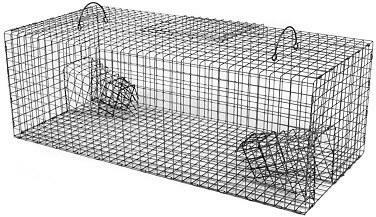 Our bird traps come assembled with small wire mesh openings, and two repeating trap doors. Birds enter the trap through funnel doors on each end of the trap. The unique design of the funnel doors encourages birds to move forward, into the traps, as they eat the bait. 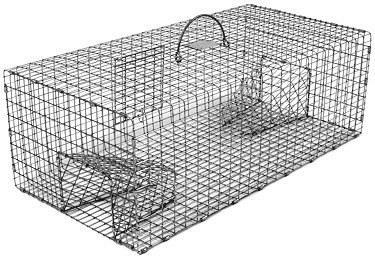 For best trapping results, construct a platform 5 to 6 feet above ground and long enough to extend 6 to 8 inches beyond each end of the trap. The platform should be pre-baited for several days before a trap is introduced. After the birds become familiar with their new feeding spot, place the bird trap on the platform. Place plenty of grain in the middle of the trap, sprinkle some around the outer edges of the trap, and make sure to sprinkle some leading into the trap. 501 Model 501 can catch and hold 20 or more sparrow sized birds at one time.